Boost commercial curb appeal with Warehouse Shade Gooseneck Lights. This contemporary light fixture features a 16" Warehouse Shade and arching gooseneck arm, all made from commercial-grade aluminum. Finish is a rust-free powder coated paint, available in a choice of 25 colors. Each UL Listed gooseneck light fixture comes standard with incandescent lamping. Mounting plates are fitted with holes at 3 1/2" on center, allowing for easy installation to most any standard 4" junction box. All aluminum gooseneck parts are powder coated to match, with the exception of the inner shade which is left white for optimal luminosity. Order commercial gooseneck lighting online or call toll free for non-standard options and accessories. 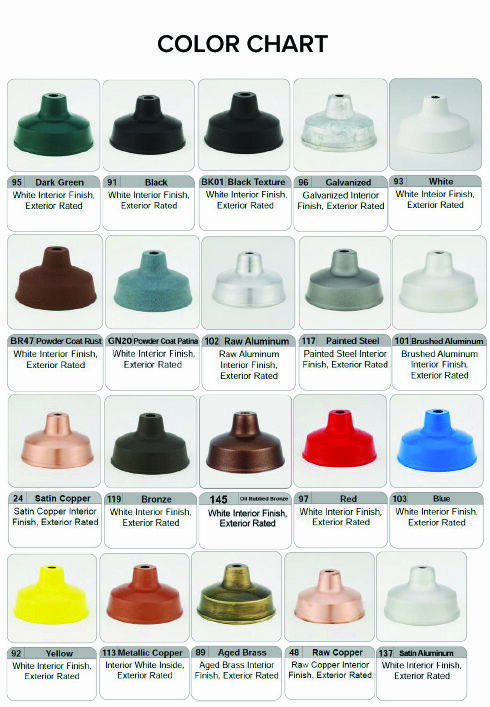 Upgraded lamping options include compact fluorescent, LED and both HID choices: metal halide and high pressure sodium. Please note ballasting may be different for MH and HPS gooseneck fixtures. Please call for details and a price quote.